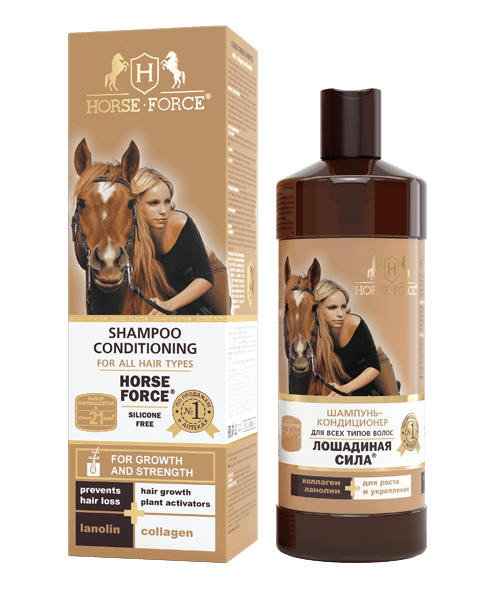 Conditioning shampoo with collagen and lanolin — Horse Force. This unique formula of Horse Force shampoo is a treatment for dull, splitting hair prone to falling, making it look healthy and beautiful again. The shampoo thoroughly cleans,conditions and polishes your hair at the same time. Active ingredients provide professional treatment for your hair at home. Horse Force shampoo is the choice of celebrities! Collagen restores hair structure, flattens ceramide flakes, moisturizes and protects the natural cover of the hair core. Lanolin protects head skin from excessive drying in case of too frequent washing, preserve natural moist. Provitamin B5 creates a protective film, preserving your hair from loosing moist if dried with hairdryer or using styler. Apply a small quantity of shampoo to palms of hands, distribute it along the whole length of your hair. Massage your head with soft movements for 1 minute. Rinse thoroughly. Repeat if necessary.